ORLANDO, Fla. — The discovery of intelligent aliens would be mind-blowing in many respects, but it could present a special dilemma for the world's religions, theologians pondering interstellar travel concepts said Saturday (Oct. 1). Christians, in particular, might take the news hardest, because the Christian belief system does not easily allow for other intelligent beings in the universe, Christian thinkers said at the 100 Year Starship Symposium, a meeting sponsored by the Defense Advanced Research Projects Agency (DARPA) to discuss issues surrounding traveling to other stars. In other words, "Did Jesus die for Klingons too?" as philosophy professor Christian Weidemannof Germany's Ruhr-University Bochum titled his talk at a panel on the philosophical and religious considerations of visiting other worlds. Here's how the debate goes: If the whole of creation includes 125 billion galaxies with hundreds of billions of stars in each, as astronomers think, then what if some of these stars have planets with advanced civilizations, too? Why would Jesus Christ have come to Earth, of all the inhabited planets in the universe, to save Earthlings and abandon the rest of God's creatures? 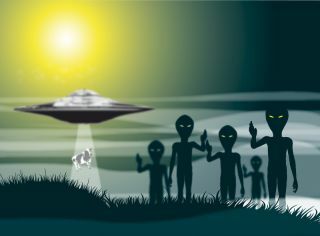 "If there are extraterrestrial intelligent beings at all, it is safe to assume that most of them are sinners too," Weidemann said. "If so, did Jesus save them too? My position is no. If so, our position among intelligent beings in the universe would be very exceptional." Another possibility is that God incarnated multiple times, sending a version of himself down to save each inhabited planet separately. However, based on the best guesses of how many civilizations we might expect to exist in the universe, and how long planets and civilizations are expected to survive, God's incarnations would have had to be in about 250 places simultaneously at any given time, assuming each incarnation took about 30 years, Weidemann calculated. Rev. Thomas Hoffmann, a protestant pastor in Tulsa, Okla., said that the issues Weidemann raised were "really on target." "If life is discovered elsewhere, unfortunately we need to have more discussion about it," Hoffmann said. "I think this is a very robust conversation we need to have." While the discovery of extraterrestrial intelligence would likely spur profound soul-searching for people of all faiths, many of the world's religions might have an easier time accommodating the knowledge than Christianity, said theologist Michael Waltemathe, also of the Ruhr-University Bochum. "It seems to be only a problem of Christianity," Waltemathe said. In Islam, for example, Muhammad was a prophet, or messenger of God, not God incarnate, so additional prophets could have simultaneously visited other planets to save extraterrestrial species, he said. And Hindus already believe in multiple deities, so accommodating more to guard over alien civilizations may not be difficult. Ultimately, though, the discovery of intelligent aliens isn't likely to pose a serious crisis for Christianity, either, Hoffmann said. After all, the religion has survived challenging scientific revelations before. "Religion is essentially conservative," Hoffmann told SPACE.com. "You can put almost anything in its face and it's going to shake out a little bit, and then it's going to drop right back down. We've seen this happen historically."